A most charming example of chromatic dispersion in nature is a rainbow. 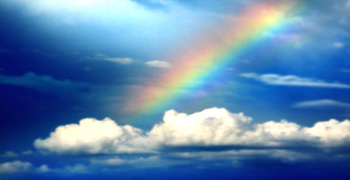 For a rainbow to be seen the sun must be shining in one part of the sky and water drops in a cloud or in falling rain must be present in the opposite part. When we turn our backs toward the sun, we see the spectrum of colors in a bow. Dispersed sunlight by millions of tiny spherical water droplets that act like prisms, forms the spectacular colors of rainbow. 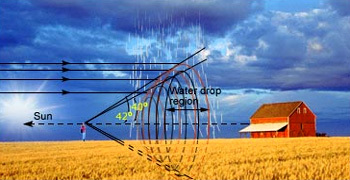 For better understanding we will consider an individual raindrop, as shown below. When white sunlight is intercepted by a falling raindrop, some of the light refracts into the drop, reflects from the drop&apos;s inner surface, and then refracts out of the drop. As with the prism, the first refraction separates the sunlight into its component colors, and the second refraction increases the separation. Dispersion of sunlight by a single raindrop We see rainbows because of the geometry of raindrops. When the sun shines from behind us into the rain, incident rays of light enter the drop and are refracted inwards. The rainbow you see is formed by light refracted by many such drops; the red comes from drops angled slightly higher in the sky, the blue from drops angled slightly lower, and the intermediate colors from drops at intermediate angles. All the drops sending separated colors to you are angled at about 42° from a point that is directly opposite the sun in your view. Although each drop disperses a full spectrum of colors, an observer is in a position to see the concentrated light of only a single color from any one drop. If violet light from a single drop reaches the eye of an observer, red light from the same drop is incident elsewhere towards the feet. To see red light, one must look to a drop higher in the sky. The color red will be seen when the angle between a beam of sunlight and the light sent back by a drop is 42°>. The color violet is seen when the angle between the sun rays and deflected light is 40°. 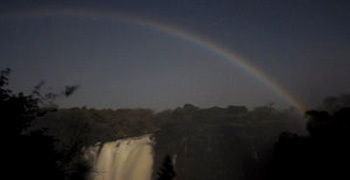 If the rainfall is extensive and brightly lit, you see a circular arc of color, with red on top and blue in the bottom. 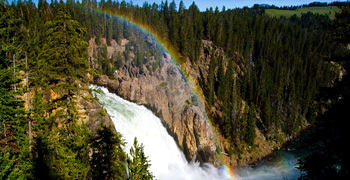 Your rainbow is a personal one, because another observer intercepts light from other drops. 3D Rainbow Cone We find that the raindrops that contribute to your rainbow all lie on a cone with its apex at your eye. So when you are looking at a rainbow, you are looking at the collected light from many many raindrops which, for a fleeting moment, collectively produce a "cone of color" with its apex at your eye. From the ground level, only an arc of the rainbow is usually visible. A complete circular rainbow may be seen from an elevated position such as from an aeroplane. Because of lack of distance cues, rainbow appears to be a flat two dimensional arc. The rainbow you see is actually a three–dimensional cone with the tip (apex) at your eye. The rainbow you see is the edge of a three–dimensional cone that extends through the water–drop region. The three–dimensional cone is a collection of innumerable layers of drops formed by innumerable two–dimensional arcs. When you move, your rainbow moves with you. So you can never approach to its end. Secondary rainbow - Caused by double reflection of sunlight inside the raindrops The secondary rainbow is fainter than the primary because more light escapes from two reflections compared to one and because the rainbow itself is spread over a greater area of the sky. Two refractions and a reflection in water droplets produce light at all angles up to about 42°, with the intensity concentrated where we see the rainbow at 40° to 42°. No light gets out of the water droplet at angles greater than 42° unless it undergoes two or more reflections inside the drop. So the sky is brighter inside the rainbow than outside it. Notice the weak secondary rainbow to the right of the primary. Often a larger, secondary bow with colors reversed can be seen arching at a greater angle around the primary bow. We won&apos;t treat this secondary bow except to say that it is formed by similar circumstances and is a result of double reflection within the raindrops. Because of this extra reflection (and extra refraction loss), the secondary bow is much dimmer, and its colors are reversed. Some other bows, in addition to these principal rainbows are sometimes observed and are called supernumerary bows. Why does a CD reflect colors? In a CD, the angle that the CD is held controls the colors you see — the angle controls the path difference. Hence, the colors are visible. Exploring rainbow colors with compact discs! Another good example of dispersion of light beam due to diffuse reflection is the case of why compact discs look multicolored. 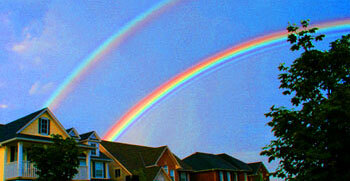 Rainbows appear when raindrops (which act like a prism) reflect sunlight, and break white sunlight into colors. We can explore the phenomenon of breaking white light into colors by using a compact disc (or CD), and shining a flashlight on it, or even better, using a fluorescent light to see the colors on it. 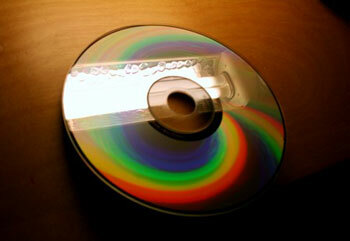 Look at a compact disc – it reflects light that is colored. The compact disc is actually very smooth, but it has information written on it – which makes tiny ridges on the disc. These ridges (roughness of the surface) are responsible for diffused reflection. In fact the reflection is different for different wavelengths. We have all seen rainbows during the day but what about rainbows at night? Lunar bows are relatively faint, due to the smaller amount of light reflected from the surface of the moon. Lunar Rainbows: These are formed when the white light from the moon are reflected and refracted by the raindrops in to the atmosphere. Moonlight is much fainter (less brighter) than sunlight and hence a lunar rainbow is not very bright. Therefore it appears as a white arc due to less sensitivity of human eyes towards light at dark nights. We cannot distinguish any color in the darkness. Secondary Rainbow A secondary rainbow appears outside of a primary rainbow and develops when light entering a raindrop undergoes two internal reflections instead of just one (as is the case with a primary rainbow). A secondary rainbow appears outside of a primary rainbow and develops when light entering a raindrop undergoes two internal reflections instead of just one. The intensity of light is reduced even further by the second reflection, so secondary rainbows are not as bright as primary rainbows. The color scheme of the secondary rainbow is opposite of the primary rainbow. Violet light from the higher drop enters the observer&apos;s eye, while red light from the same drop is incident elsewhere. Simultaneously, red light from the lower drop enters the observer&apos;s eye and violet light is not seen. This is why the colors of a secondary rainbow change from violet on the top to red on the bottom. A fogbow is much like a rainbow, made of sunlight and water drops(moisture), but caused by the small droplets inside a fog (or) cloud, rather than the larger raindrops. Just as the rainbows, fogbows are seen in the direction opposite the sun. one might observe a fogbow when the sun breaks through a fog (or) it can be observed on top hill beside the ocean. Due to the small size of water droplets in the fog, a fogbow displays very weak colors and some times no colors at all. Colorless fogbows are sometimes known as the white rainbows. Supernumerary rainbow in sky and in the garden from a garden spray It is an infrequent phenomenon, consisting of several faint rainbows on the inner side of the primary rainbow.It is an infrequent phenomenon, consisting of several faint rainbows on the inner side of the primary rainbow. Usually, Inside the primary rainbow there are a series of fainter bows that are present which are a result from diffraction phenomenon, rather than refraction, of sunlight in small water droplets. In essence, when two parts of a light wave pass through a water droplet along slightly different trajectories, they re–emerge at nearly the same position but not exactly the same position. Hence this gives rise to the interference pattern, which we see as colored rings just inside the primary bow. If the falling rain drops are of nearly of same size we can expect supernumerary rainbows. We can also make a supernumerary rainbow just from a garden sprinkler. Since the sprinkler produce uniform droplets of water. Spiderweb Rainbow What we're seeing is the result of diffraction. A strand of spiders silk is only two to three times the size of a wavelength of visible light, so the two interact significantly. When a wave of light hits the web, it gets scattered in many different ways. The wave moves around the web, or it gets reflected by the web, or it sometimes moves through the material of the web. Apart from these five rainbows there are several other different types of rainbows. Red Rainbow: This type of rainbow occurs during the sunset, as the light travels far distance to reach the water drops, and so as it reaches the rain drops the blue end of the spectrum is lost (or) scattered which makes the red light to emerge from the rain drop, which form red arcs of light. 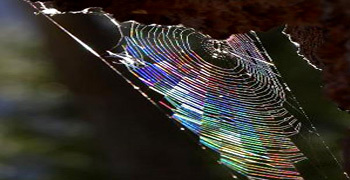 Spider Web Rainbows: The dew–covered spiders webs may show fragments of some faint rainbows. Surf Bows: Normally, this type of rainbow occurs at the beach. Circular arc of the rainbow opposite to the Sun If the sun is high in the sky, you just see the top of the circle and the rainbow looks flat. If the sun is low, you can see a full semicircle, and if you are in a plane you can see a full circular rainbow. Most people have never noticed that the sun is always behind them as they face a rainbow. The center of the circular arc of the rainbow is in the direction opposite to that of the sun. We know that the rain, is in the direction of the rainbow. Why don&apos;t we see a full circular rainbow? We generally don&apos;t see a full circular rainbow because the earth gets in the way. The lower the sun is to the horizon, the more of the circle we can observe at its sunset. we could see a full semicircle of the rainbow with the top of the arch 42 degrees above the horizon. As the sun gets higher and higher in the sky during the day, the smaller will be the arc of the rainbow above the horizon. Colors of the rainbow The interaction that occurs to create the rainbow will produce a spectrum of colors in order Red - Orange - Yellow - Green - Blue - Indigo -Violet (ROY G BIV) with Red occurring on the outside edge of the rainbow to Violet occurring on the inside edge (closest to the center) of the rainbow. 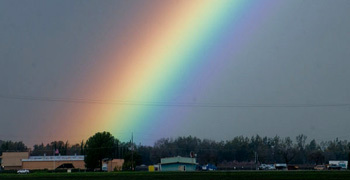 As we have seen there are seven colors in a rainbow VIBGYOR: which are Violet; Indigo; Blue; Green; Yellow; Orange; Red. Lets us know the meaning of each color. Violet: This is the last or the lowermost color in a rainbow. One can get this color as a combination of red and blue. It is the highest and the subtlest specialization of light, as it is at the opposite end of the color red. Indigo: This is the second color from the bottom in a rainbow. A deepened version of the color blue would give indigo. The energy of the color blue is multiplied by indigo. Blue: This is the third color from the bottom of the rainbow. When we think of blue and what we get in mind is oceans and the sky. Blue is termed as the nature&apos;s color. Blue is the first primary color that comes in VIBGYOR. Green: Green is the fourth color from the bottom of a rainbow. This color stands in the middle of the rainbow. The color green is formed when the two colors yellow and blue are combined. Hence, this color is located in the center of the spectrum. This is the second primary color in VIBGYOR. Yellow: This is the fifth color from the bottom of the rainbow. This color is the combination of Red and Green. This is the first secondary color to be observed in VIBGYOR. Orange: This is the sixth color from the bottom of the rainbow. The color orange is a combination of red and yellow. This color is often observed as orangish-red in nature during sunrise and sun set. Red: This is the seventh (or) the top most color in a rainbow. Red is also the color with the longest wavelength. This is one of the three primary colors observed in VIBGYOR. All these colors belong to the visible region of Electromagnetic spectrum. This spectrum is huge consisting of many regions of which humans can observe a small window of Visible colors in visible region.